Crabs are in the phylum Crustacea. They are decapods (having ten legs), along with lobsters, crayfish and shrimps. 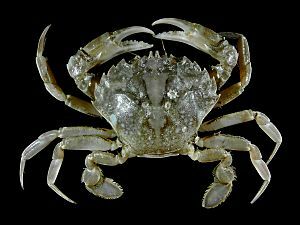 Crabs form an order within the decapods, called the Brachyura. Their short body is covered by a thick exoskeleton. Crabs have short tails. A crab's tail and reduced abdomen is entirely hidden under the thorax. It is folded under its body, and may not be visible at all unless the crab is turned over. Usually they have a very hard exoskeleton. This means they are well protected against predators. Crabs are armed with a single pair of claws. Crabs can be found in all oceans. 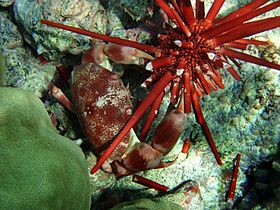 Some crabs also live in fresh water, or live completely on land. Crab Facts for Kids. Kiddle Encyclopedia.